Stumbled across this intriguing story this week - as part of former Bath & England prop David Flatman's testimonial year he is staging an “Ashes” boxing match in London between ex-England enforcer Danny Grewcock (described by Flatman as "probably world rugby's most violent individual ever") and controversial ex-Wallaby lock Justin Harrison. 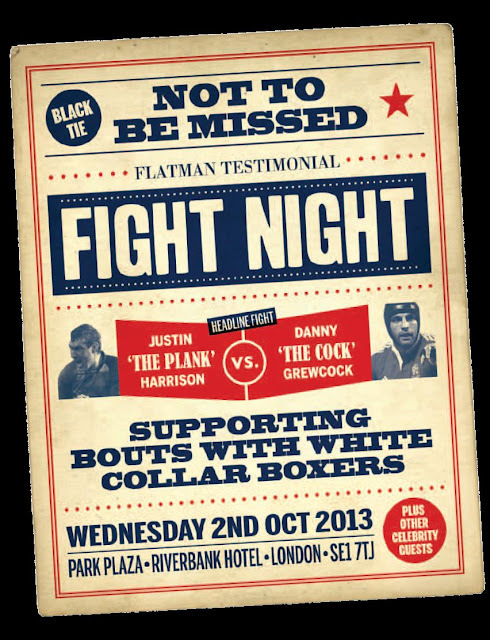 According to Flatman he only considered having a testimonial after a conversation with a British soldier whose legs had been blown off in Afghanistan in which he was reminded that "Your testimonial dinner could pay for my next set of legs." The testimonial is therefore helping raise money for three charities - Help for Heroes, The Burned Children's Club and Down's Syndrome Association. This blog has been a big fan of David Flatman - both as a vastly underrated prop and as an insightful and witty columnist for The Independent newspaper - and this event goes to prove what a very decent bloke he is too. A big hand also for Messrs Grewcock and Harrison and others taking part for supporting the charities and their old mate in this way.